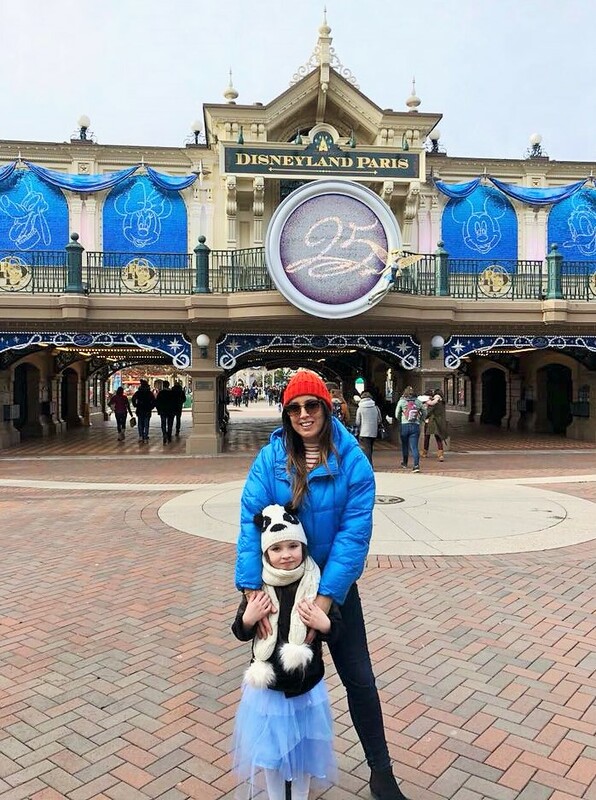 Booking our first trip to Disneyland Paris was a childhood dream come true for me. I can’t tell you how happy I was to finally realize I was going there after imagining it for so long as a child. My best friend in primary school got to go to Disneyland Florida many times on Summer holiday’s when we were young and I was so, so jealous. Good jealous if you get me! She was always so kind to bring me back a Disney themed present too which made my day. Thanks Nicola if you’re reading this, I’ve never forgotten! So once I became a mammy it had been my plan from the get go to book this trip when I felt Olivia was old enough to enjoy it as much as possible and most importantly to remember it. I decided that while I was on maternity leave and Olivia was turning five on her next birthday, it was the right time to go. In the weeks leading up to our Valentine’s day departure, we started to gather lots of information together from friends that had been before, finding out the do’s and don’ts, reading blog posts for more tips and watching YouTube videos to see exactly what it was like in the parks. Taking a virtual tour was great. That way it didn’t feel totally alien when we arrived there. These kind of trips you will definitely need to prepare for. We were there for 3 nights and 4 days so we had to cram a lot in and there was no time to waste by not knowing what we were doing or where we were going. We flew with Air France from Dublin to CDG Paris and we had the Magic Shuttle Bus booked to take us from the airport to our hotel in Disneyland which took about half an hour. We stayed in Santa Fe hotel. It has only a 2 star rating but it’s immaculate and I had already spoken to friends who had stayed there before and they had told us it was fine. Each Disney hotel has a theme and at Santa Fe it’s the movie – Cars. That theme alone was such a cool novelty for Olivia and my nephew Freddie who also came with us. We left the baby at home because we wanted to experience the park the best we could with the older kids, Oscar is far too young, where as Olivia (5) and Freddie(12) are just the perfect age. We arrived at our hotel at 11am but our room wasn’t ready for us until later on, so we dropped our bags at the baggage hall and went straight to Disneyland. We hopped on the complimentary shuttle bus that runs every fifteen minutes to and from our hotel. They tell you the parks are within walking distance but with all the walking you’ll be doing every day I’d highly recommend taking the bus. When we rocked up to the security gates the excitement was building in all of us, even though we were absolutely knackered after our journey, adrenaline took over. We were in Disneyland after all! Once we were inside we chose to go to Disneyland Park first and had planned on covering Walt Disney Studios on day 3 &4. We walked towards Main street USA and when we turned that corner and saw La Chateau de la Belle au Bois Dormant (Sleeping Beauty’s Castle) twinkling in the distance, my eyes started to fill with tears. I’m deadly serious. I was finally in Disneyland and it was the best feeling ever! We took numerous photos along the way and as we walked through the castle we could see where the rides began. The first ride that we went on was the carousel. We said we’d ease ourselves in, you know?! This was also when we realized how busy it was there. The queues were so long for every ride but the longest we queued for was an hour. If the sign at a ride said 70 minutes wait time, we just walked away and tried again later on. Yes there’s fast track and single riders but we didn’t avail of those because the few times we tried to fast track, their machine was down. Typical! I booked the trip unknowingly during midterm break. It was great that I didn’t have to take Olivia out of school but it was also not so great that Disneyland was THRONGED with people. Off season is a better time to go especially if you have smaller kids. We saw many a toddler tantrum and very stressed out parents too. Having a map of the parks and downloading the Disneyland Paris app is a must. You’d be lost without it, quite literally too! We got a good feel for the place on our first day there. I won’t lie, we were wrecked from walking, but getting into bed that night and every other night after was great because we had no trouble sleeping. We started each day with a bang and we had my husbands backpack packed with food from our hotel breakfast to have for our lunch later in the day. Nothing had prepared me for the cost of food and drink there, and I mean nothing. I was already told it was pricey but I kind of let it go over my head. I thought ‘how pricey can it actually be?’ But boy were they right! It’s the only negative thing I can say about Disneyland because I feel it shouldn’t be allowed to continue with the extortionate prices. Your average bottle of water cost 3.70 and yes there are fountains all around the park (not so easy to find mind you) but when we did find them, not one of them worked so we couldn’t refill our water bottles. The restaurant prices are very steep for what you get too and their menus are quite basic so just be prepared to spend. Your average basic kids meal is between 15-20.00 euro. Grab a McDonalds every now and then, it’s not so hard on the wallet! The all you can eat buffet at our hotel was well worth it too. A little tip I would definitely tell everyone is, if you’re staying in one of the Disney hotels there’s an Esso garage (beside Santa Fe) just like any petrol station over here that sells the usual sandwiches and rolls, sweets and chocolate etc. but for a fraction of the price in the parks. We stocked up on our snacks and treats there to have back at our hotel room also. It saved a lot of money once we figured that one out. I found the Disney merchandise quite reasonably priced though. The choice is phenomenal as you can imagine. I wanted to buy so much of it. Although the Princess costumes will set you back 70 euro the quality of them are great. I brought Olivia’s own Cinderella dress with us as I knew she would only wear it on the day we went to Princess Pavillion so we didn’t have to buy a dress (this time)! Most rides allow kids under 7 years old on them, as long as they’re accompanied by an adult and not too short. If your child is brave enough then great, but some of them are quite fast and scary so just be aware. We brought Olivia onto Thunder Mountain roller coaster and we never got her onto another fast ride again. She freaked out at us afterwards for bringing her on it, I felt so bad but I couldn’t help having a little giggle too. It was so much fun and only a taster of what was to come. If you’re looking for a super thrill then Space Mountain, Aerosmith Rock n Roller Coaster, The Tower of Terror and Indiana Jones are great ones. We went on so many fun rides together too – Peter Pan’s Flight, It’s a Small World, Autopia, Dumbo, Slinky The Dog, Pirates of the Caribbean, Mad Hatters Teacups, The Disneyland Railroad and the Studio Tram Tour Behind the Magic are all worth going on. But Olivia’s all time favourite was the Toy Soldiers Parachute Drop in Toy Story Playland and Freddie’s was Rock N Roller Coaster. On our third day there Olivia and I spent the morning in Princess Pavillion queuing to meet Snow White. She was an absolute dream and Olivia’s love for princesses has blossomed ever since. After that magical meeting we went on to meet the main man himself (no, not Santa Claus…) Mickey Mouse! The great thing about joining the large queue was that we were in the Mickey Mouse theatre and in here they have a big screen showing Mickey Mouse cartoons continuously so that kept all the kids entertained. Meeting Mickey was super fun. Olivia told him we were from Ireland and he did a little Irish jig for us, it was so cute. Olivia was totally star struck by him. Although it took so long just to meet those two characters, it was really worth the wait, I’ll treasure our photos forever. And while us girls were busy meeting characters, the boys were off enjoying adrenaline filled rides, so we had happy faces all round that afternoon! We availed of the Extra Magic Hours on our last morning there. This means once you’re staying in a Disney Hotel you can enter the park at 8.30am ahead of the usual 10am opening time and get on rides without the long queues and meet other Disney characters too. This is totally worth it if you’re an early bird and want to beat the queues with small kids. The highlight of the trip for Aaron and I was seeing the spectacle that is Disney Illuminations which is on each night at 8pm at Sleeping Beauty’s Castle. From what I can gather it’s a different show this year because Disneyland Paris is celebrating it’s 25th Anniversary. That night I cried tears of joy. I’m such a baby I know, but seeing the stunning lights show and fireworks display with the beautiful Disney songs was so overwhelming. We were in one of the happiest places on earth and I was with the people I loved, it was very special. That alone I would go back to see again. The Disney stars on parade is a must see too, the parade starts at 5pm each day and is a great way to see every Disney character and their amazing floats. I booked our trip with my friend – Aisling Cullen Kutay – Travel Counsellor. I literally didn’t have to worry about a thing. I just didn’t trust myself to do it all properly the first time around, so the best thing for me to do was pass it on to someone who knew what they were doing and it was completely hassle free. Our plan is to return when Oscar is five and I’m looking forward to it already…. PreviousTried & Tested – Coconut Oil for Cradle Cap.